For this Classical Comments piece we will deal with some architectural minutiae—the transition from Roman-style moldings to Greek ones that took place in the late 18th century. Until the publication in 1762 of the first volume of James Stuart and Nicholas Revett’s The Antiquities of Athens virtually all 18th-century molding profiles in both Britain and America adhered strictly to ancient Roman versions as depicted in the Renaissance treatises of Palladio, Vignola, Scamozzi and others. For their sources these architects measured and published the examples close at hand, which were in abundance in the Roman ruins around them. High-style Greek ruins were all but inaccessible for study, Greece having succumbed to unwelcoming Ottoman rule with the fall of Constantinople in 1453. Figure 1. The Tuscan order. Andrea Palladio, The Four Books on Architecture (1570) Tavernor and Schofield edition, 1997, Book 1, p. 28. Figure 2. James Gibbs, Rules for Drawing the Several Parts of Architecture (1732), Plate XXIV. Figure 3. Abraham Swan, The British Architect (1745), Plate II. 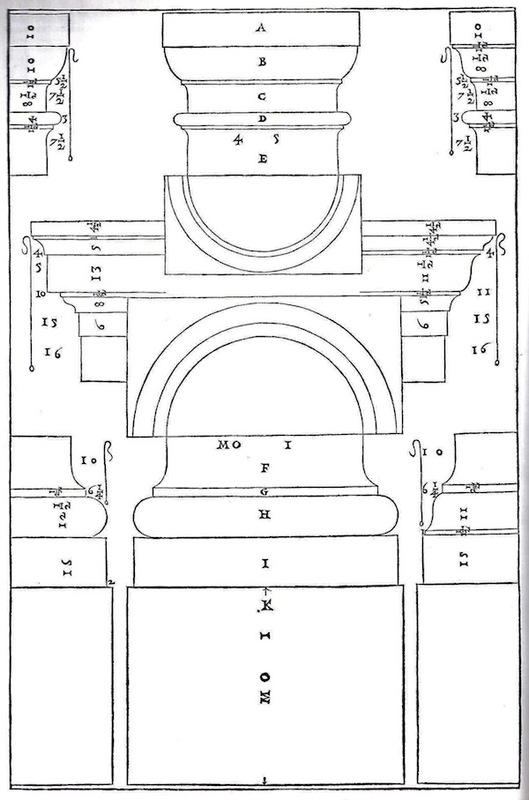 As with Palladio’s Tuscan, Abraham Swan’s plate of the Tuscan order reveals the straightforward character of typical Roman moldings. 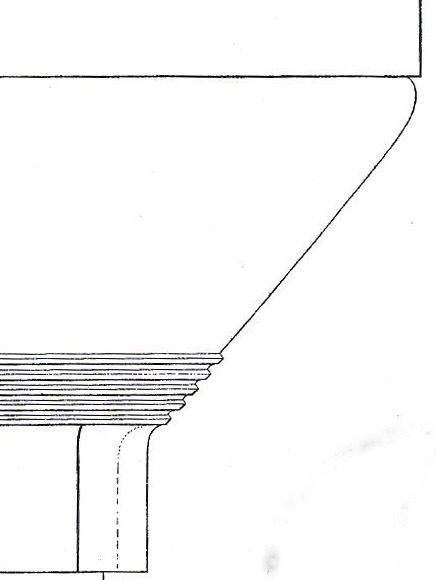 (Figure 3) Beginning with the cyma recta in the crown molding, each curve of the S-shaped molding has only a single radius. This pattern is followed in the bed moldings, consisting of the convex quarter-round ovolo and below it the concave, quarter-round cavetto. In the capital, the echinus takes on a quarter-round contour, and the astragal has a half-round profile. Likewise, in the base, the torus is a bold, half-round molding, providing visual support to the weight of the columns and entablature. Figure 4. 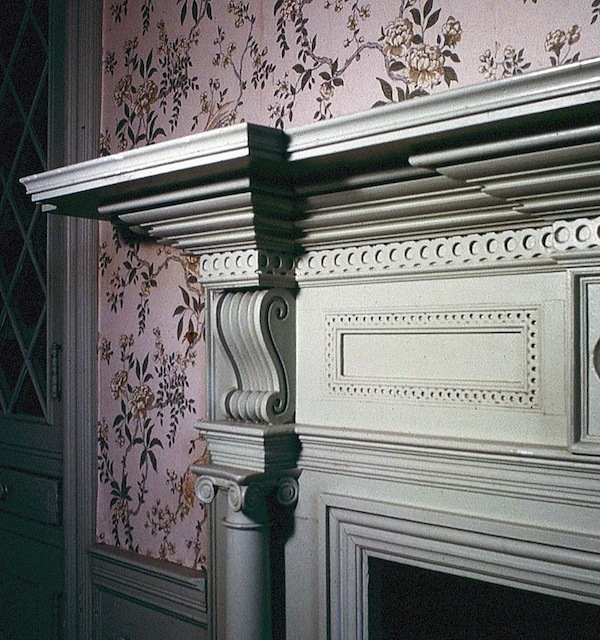 Second-floor mantel, Drayton Hall, Charleston, South Carolina. Figure 5. William Salmon, Palladio Londinensis (Second edition, 1738), Plate XXIX (detail). Figure 6. James Stuart & Nicholas Revett, The Antiquities of Athens, Vol. 1, 1762, Chapter II, Plate VI (detail). 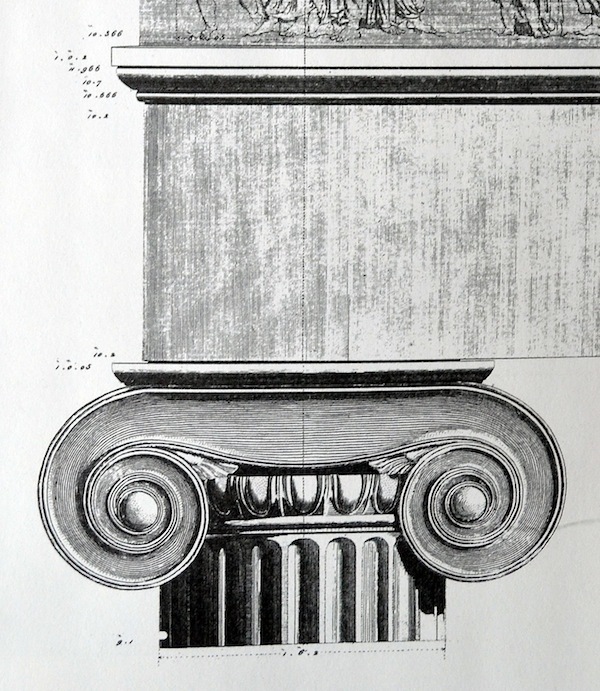 Britons were introduced to the elegance and complexity of Greek moldings with the appearance in 1762 of the first volume of Stuart and Revett’s The Antiquities of Athens. This monumental undertaking, with its numerous engravings of plans, elevations, details, and conjectural restorations, made an indelible impression on the British architectural community and marked the birth of the Greek Revival movement. Pictured in the first volume were several plates pertaining to the Ionic temple on the Ilissus River in Athens. In a detail of the temple’s capital and entablature, the abacus has the profile of a quirked ovolo instead of the straight-sided slab typical of Roman orders. (Figure 6) A quirked ovolo is an ovolo that takes the form of an ellipse and turns inward towards the top, leaving a small space between it and the member above it. Since the curve of an ellipse is complex, requiring several radii to define it, it can take many different profiles from boldly curved to tightly compressed. Another quirked ovolo is seen supporting the taenia. Robert Adam was among the first British architects to incorporate Greek moldings and other Grecian details in his designs. In Volume I of The Works in Architecture of Robert and James Adam, Esquires (1778) Adam stated his partiality for Greek moldings. Figure 7. Robert and James Adam, The Works in Architecture of Robert and James Adam, Esquires, Vol. 1, plate 59 (detail). Adam employed a personalized Greek Ionic order for the exterior of London’s Lansdowne House. The detail of the order shown here is dated 1765 and was published in Adam’s Works in 1778. (Figure 7) While the abacus follows Greek precedent by being an ovolo rather than a straight-edged slab, its profile is a Roman-style ovolo. The moldings separating the frieze from the architrave, however, incorporate what is definitely a Greek quirked ovolo supporting a fillet. The source for Adam’s Greek details was likely The Antiquities of Athens. He also derived Greek details from engravings by Giovanni Piranesi, who published prints of Greek Ionic capitals copied from Julien-David Le Roy’s Ruines des plus beaux monuments de la Grèce (1758). Piranesi worked with Adam for a time, executing some of the engravings for Works. Figure 8. Asher Benjamin, The American Builder’s Companion (1806) plate 15. 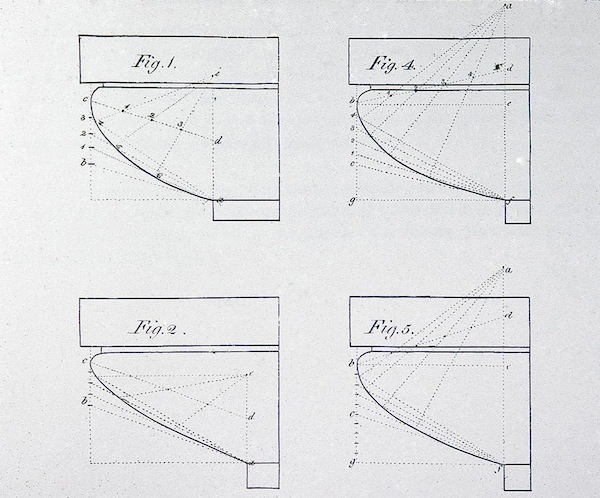 A is a Tuscan cornice copied from Langley, [A is the dotted line] and seen at an angle of forty five degrees from the horizon, (Fig. 2) which is the angle cornices are commonly seen at. B is a modern cornice, which is only two thirds of the height. This experiment proves, that a cornice, when seen at the angle of forty five degrees, may be diminished one third of its height, and appear to the spectator to be diminished only two elevenths; and when seen at an angle of fifty degrees, (Fig. 3) which is a little nearer to the building, it may be diminished one third, and appear to be diminished one sixth . . . which will make a saving of at least one fourth of the expense, beside having so much of the height of the wall of the whole building, and at the same time have a lighter and better appearance. Figure 9. 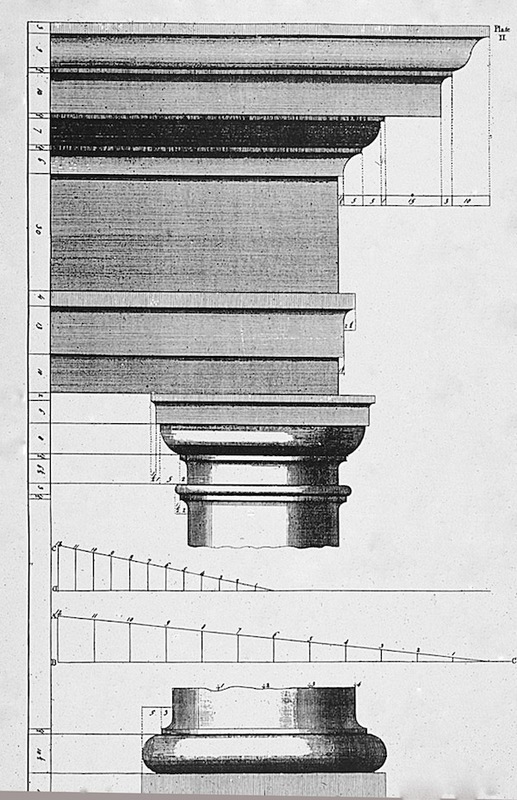 Asher Benjamin, The American Builder’s Companion (Sixth edition, 1827), Plate I I [eleven] (detail). 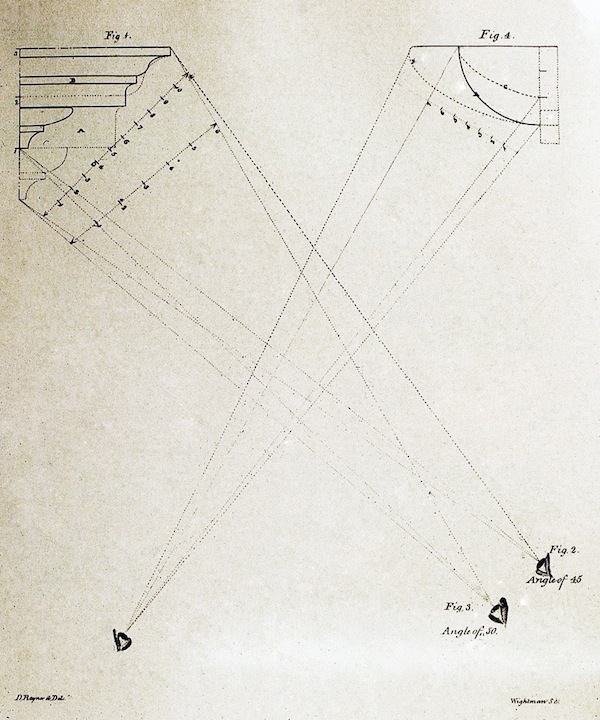 In the Roman ovolo there is no turning inward, at the top; therefore, when the sun shines on its surface, it will not be so bright, on its upper edge, as the Grecian ovolo; nor will it cause so beautiful a line of distinction from the other moldings, with which it is combined, when it is in shadow, and when lighted by reflection. 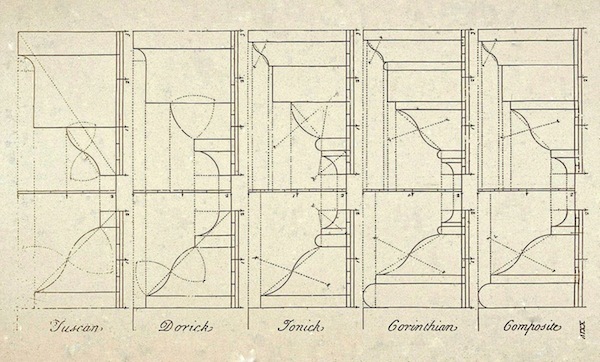 The various radii making up each molding in Benjamin’s plate are seen in the dotted lines and reveal the complex sophistication of Greek moldings. Figure 10. 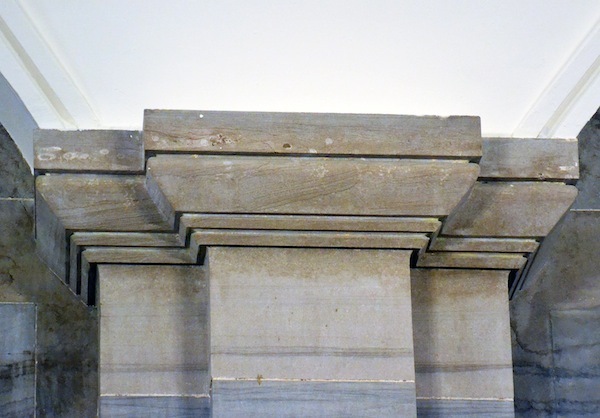 Greek moldings, Tennessee State Capitol, Nashville (Loth). Figure 11. The Rules of Work of the Carpenters’ Company of the City and County of Philadelphia (1786) Plate XVI. Figure 12. James Newlands, The Carpenter’s Assistant (London, undated: ca. 1850) plate LXV (detail). 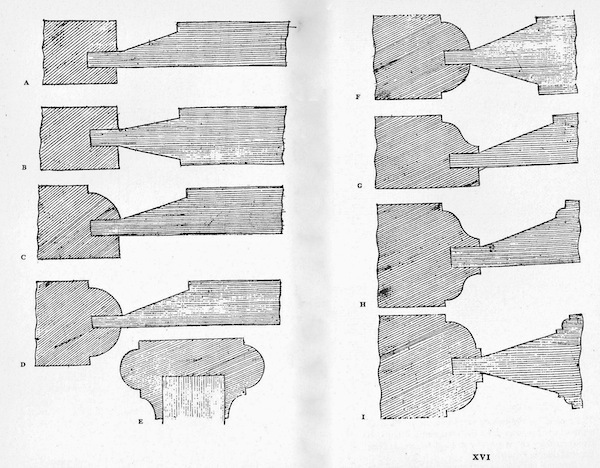 We can see the change in treatment of panel moldings from the 18th century to the 19th century by comparing a plate in the in the 1786 Philadelphia Carpenters’ Company Rule Book with one in James Newlands’ The Carpenter’s Assistant, (Figures 11 & 12) Though Newlands’ work is British, his illustrations are consistent with American practice starting in the early 19th century. In the Carpenters’ Company illustration, we see how typical Roman-style panel moldings are cut from the rails and stiles and that the fielded panels are sharply beveled on one face or both. 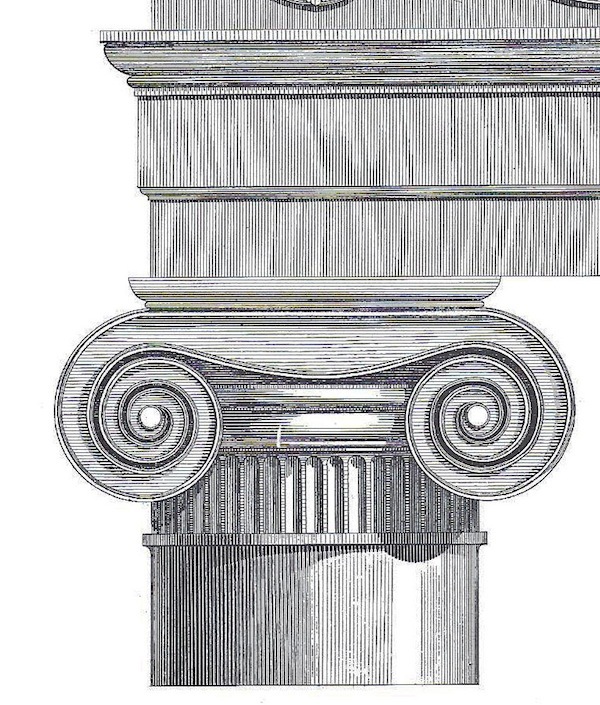 Newlands’ moldings employ Greek quirked ovolos. Instead of being part of the rails and stiles, his moldings are separate members applied over the junction of the panels with the rails and stiles. Note too, the panels are not beveled. 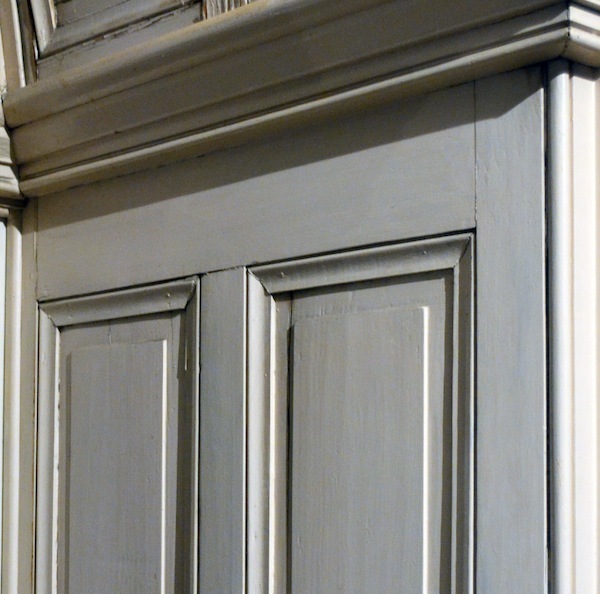 This change in panel treatment, employing applied moldings, became almost universal throughout the country in the 19th century. Figure 13. Door jamb panel, Virginia School for the Deaf and the Blind, Staunton, Virginia (Loth). Figure 14. 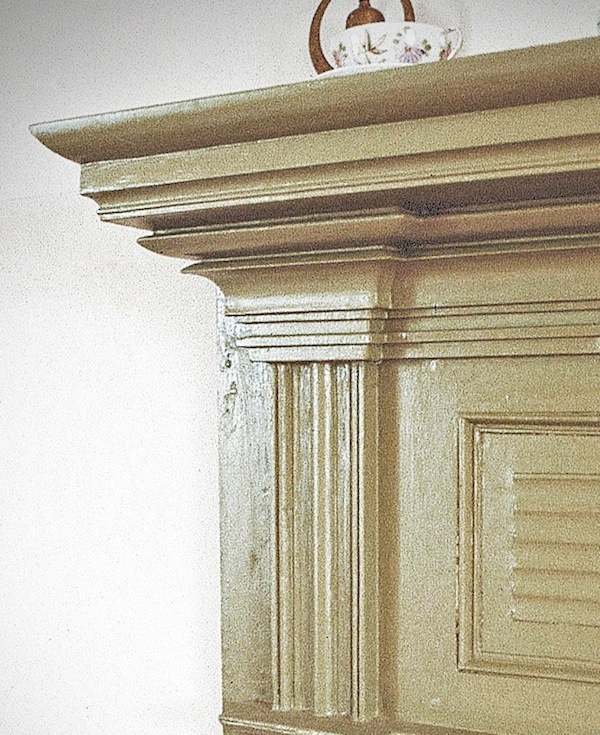 Mantel detail, Annandale, Buckingham County, Virginia (Virginia Department of Historic Resources). Figure 15. Mantel detail, Glen Maury, Buena Vista, Virginia (Loth). Figure 16. Minard Lafever, The Modern Builder’s Guide (1833) Plate 53. Although Greek moldings continued in use into the third quarter of the 19th century, they soon passed out of fashion in favor of more complex Italianate and Gothic-style moldings. 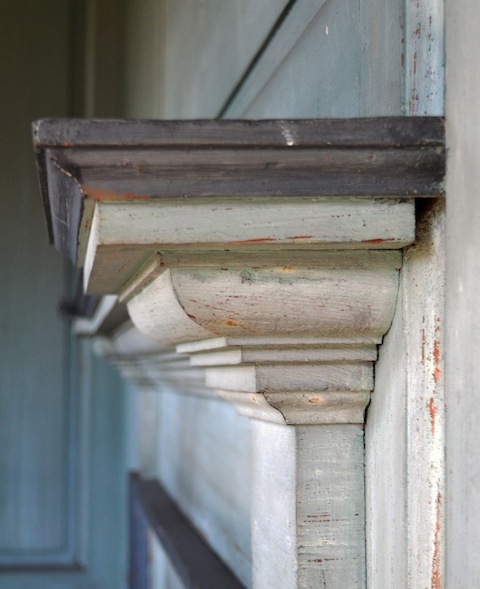 They all but disappeared from use in the early 20th century with the widespread popularity of the Colonial Revival movement, which brought about a resurgence of Roman moldings imitating 18th-century practice. Nevertheless, following Asher Benjamin’s observations, we should not discount the value of Greek moldings for adding a distinctive aesthetic quality to contemporary classical design. Partricia Ann Lowe, Volumes that Speak: The Architectural Books of Drayton Library Catalog and the Design of Drayton Hall (Clemson University and the College of Charleston Master’s Thesis. May, 2010). The tiny temple has since been destroyed. Robert and James Adam, The Works in Architecture of Robert and James Adam; (Dover Publications, 2006) p. 6. Asher Benjamin, The American Builder’s Companion (Boston, 1806) p. 29. Benjamin, The American Builder’s Companion (sixth edition; Boston, 1827) p. 20. Minard Lafever, The Modern Builder’s Guide, p. 3-4. 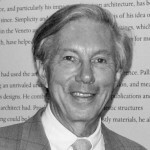 This entry was posted in CLASSICIST / ICAA and tagged Calder Loth, chadsworth columns, CLASSICIST, greek moldings, icaa, moldings, roman moldings by Chadsworth Columns. Bookmark the permalink.